“Make Offer” domains now distributed to Go Daddy through SedoMLS. Sedo announced today that it has expanded its distribution partnership with Go Daddy to include “make offer” domain names. In January Go Daddy joined the SedoMLS network. That meant that fixed priced domains at Sedo that were opted into SedoMLS would show up in the registration path at GoDaddy.com. Go Daddy customers could purchase the domains by following a link to Go Daddy Auctions. The expanded partnership means domains listed on SedoMLS without a price will also be promoted within the GoDaddy.com registration path. Customers can complete the negotiations and purchase through their Go Daddy account. The deal is similar to one with Afternic, which was expanded in July. Although the ratio has been changing quickly in recent years, Sedo has always had a high number of unpriced domain names. This new deal will give significant exposure to domain names listed on SedoMLS. New process includes “Big Data Pricer”. 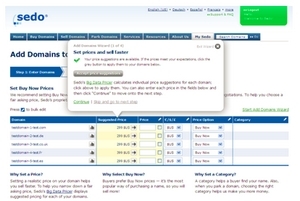 Sedo has updated the process of listing domain names for sale with the service. There’s a pretty slick wizard that walks you through the process. The new process includes the company’s “Big Data Pricer”, which provides price suggestions for your domain names based on the same methodology used for theIDNX. You can choose to accept the price as a listing price if you want. The suggested prices calculate fairly quickly. The system also suggests categories, although when I tried adding domains it got stuck on “waiting” for the category suggestions. The new system also allows you to activate SedoMLS Premium for a domain while you go through the process. New sales channels are opening up for domainers thanks to efforts by Afternic, GoDaddy, and Sedo. Over the past week Afternic turned up two new partners in its Afternic DLS Premium program and Sedo extended the beta of its SedoMLS program to large domain holders. Each new partner that gets integrated into these systems means more domain sales. Afternic has found that, with each new registrar partner it adds, sales go up — it’s not just the same number of sales being spread across more partners. The key to this sales channel working is two fold: getting into the registration path when a person is searching for a domain name and having instant transfer capabilities. That means that Mr. Small Biz can search for a domain name, find your domain for sale, add it to his cart, purchase it, and get the domain name instantly in his account. Registrars providing instant transfer for each service is important on two fronts: they provide a sales outlet for your domains and you need to have your domains at an instant transfer registrar in order to participate. Your domains don’t need to be at the same registrar as where the domain is sold; it just has to be at one of the registrars in that channel’s network. Both Afternic and SedoMLS are quickly expanding their reach, and I expect more partners for each service in 2011. Company expands beta for listing syndication and fulfillment service. SedoMLS, which syndicates your Sedo domain name listings across multiple sites and instantly transfers domain names upon purchase, is now available for select Sedo customers. Sedo launched the service last year but it has been closed to most domainers. The new beta phase permits SedoPro customers to list domains at the MLS level. Other Sedo customers with 5,000 or more domain names may request access as well. SedoMLS listings are syndicated to a number of partners, many of which enable domains to be sold and transferred instantly without seller involvement. Partners include Name.com, InternetX, and DirectNIC. The system is a competitor to AfternicDLS. AfternicDLS has a number of large registrars already in its stable including Network Solutions, Register.com, and Name.com. eNom and Moniker will be added before the end of the year. Despite not having the same major registrar distribution as AfternicDLS, Sedo may be able play to its strength in the international market. The company has a leg up on Afternic for selling ccTLDs and foreign language domain names.